In an age of flourishing e-commerce options for the hyperactive armchair shopper, success is rated in how few clickthroughs it takes to complete the process. Compartmentalising the shopping experience, from prospecting a range of items through a selection of characteristics and agreement on price has never been an easier task to perform. However, despite the monumental success of e-commerce as pioneered by Amazon and others, and the finessing of mobile technologies to encourage zero excuses to shop at any given moment, the ability to indulge in tactile experience is wholly missing. Humans come equipped with many ways to interact with the environment, and sensory perception is the mechanism by which we intuit value, attraction, and delight. And logically, if you’re going to purchase something in order to use and interact with it, then why would you not interact with it in the first place to inform your decision to purchase? These are all sensory privileges currently unattainable via your screen, and the ability to make informed purchase decisions by trusting your senses is sorely needed to ensure we can take more enjoyment in selecting the objects we surround ourselves with in life. A recent survey found both men and women enjoy physical shopping for positive but differing reasons; women want to experience products at first hand, while men simply love the instant gratification of taking purchases home. What role then does the physical architecture of a retail store play in attracting and promoting business? 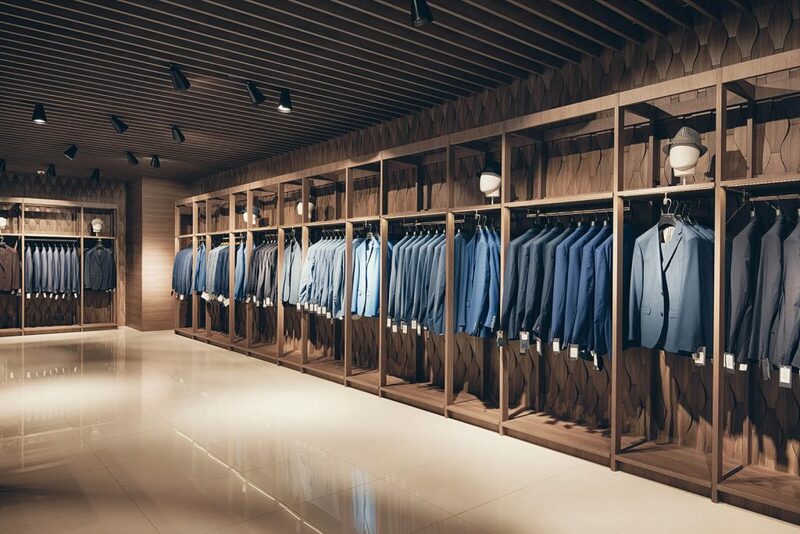 Retail design is a combination of considered interior design, architecture, product marketing and effective layout to sell products and services. To frame this less cynically and with a little more creative insight, the aim is simply to inspire. Accomplished retail design possesses the ability to engage, sell, and draw customers into your brand. Your space generates feelings of excitement, potential, relaxation, and desire simultaneously. Uninspired and ill-considered spaces fail to transmit any sense of passion on behalf of the owners, unlinked to a company culture or mission. Instead, a successful environment is uncluttered, allocating adequate space for products that respect their individual value while allowing customers to engage freely with them. In order to truly capitalise on the design potential of a retail space, any creative direction should also pay respect to the particular building’s history and find ways to relate this to the brand messaging. For example, Apple has cornered the global market in grabbing flagship traditional architectural space in major city centres, and it also manages to pair historic features with utterly modern products by restricting any major change to the restored and refurbished interiors. By stripping away clutter, it houses modern brand direction effectively within respected architecture, simultaneously emphasising both. Think about your product offerings. Consider whether a refurbishment adequately portrays them in their best light. Is it even the appropriate space for your brand identity? The idea that e-tailing provides a customer experience holds true, it’s certainly quick and reasonably flawless now. However, it’s difficult to compare this with the notion of an actual ‘experience’ that customers can enjoy within physical brick and mortars retail spaces. It also depends on the products you intend to purchase. If it’s a refill of your favourite size M tee from your regular retailer, then you possess the confidence that whatever is shipped will be the same as you normally use. With the exception of selling products that simply cannot be accessed anywhere else, the challenge is therefore to develop your unique experience that accompanies the flow from store entry to purchase. The humble cinema transformed itself from a dank, velvet curtained interior that was failing to capture customers in the face of home media sales, into a bespoke experience that allows the customer to take drinks, dine, select different seating configurations and enjoy watching a movie ‘their way’. Taking this rationale, businesses can refurbish to encompass entirely new experiential directions that veer away from simply walking in, looking around, and possibly purchasing. Although it’s not in the mindset of many companies to offer freebies for fear of seeming ‘cheap’, if customers are made to feel that they are totally free to linger awhile then this increases the chances of engagement, connection, and brand awareness retention. With this in mind, refurbishment projects should aim to create spaces that can be enjoyed and do not assail customers with products with price tickets. Men often shop with women. It’s a stereotype perhaps, but in women’s retail spaces it’s often difficult to find somewhere worthwhile to sit and relax while your partner tries on garments. Strategically situated couches, accompanied by men’s and women’s reading material, make for acceptable refuge. It’s an inspiring and welcome experience to simply sit, read, enjoy a free espresso, and people watch. It’s the small details that count. After all, many successful retail refurbishments require only detail tweaks instead of a holistic makeover. Here is the Golden Rule. Women use the bathroom on average twice as much as men. Women also control up to 85% of discretionary spending. Women will also hesitate to return to a retail store if the bathroom experience is below par. Without resorting to toilet humour, the bathroom occupies an incredibly important and functional role in daily human life. Rest, relief, mental recharge, and back out into the world. A well-appointed and considerate experience will score massive brownie points, and where’s the harm in people coming in to browse when they actually need the loo? Showing respect in this way cements the humanity of a retail brand, and any refurbishment, no matter how big in concept, should start with dollars well spent on the smallest room in the building. Workplace productivity- how to get it.